The WIKA model BNA bypass level indicator consists of a bypass chamber, which, as a communicating interface, is connected laterally to a vessel via 2 process connections (flanged, threaded or welded). Through this type of arrangement, the level in the bypass chamber corresponds to the level in the vessel. 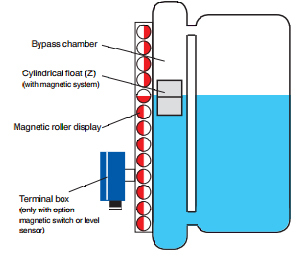 The cylindrical float (with a permanent magnet system, mounted within the bypass chamber) transmits the liquid level, contact free, to the outside via the magnetic roller display mounted on the bypass chamber. In this are fitted, at 10 mm intervals, red/white plastic or ceramic rollers with bar magnets. Through the directional magnetic field of the permanent magnet system in the cylindrical float, the magnetic rollers, through the wall of the bypass chamber, are turned through 180°. For an increasing level from white to red; for a falling level from red to white. Thus the bypass level indicator displays the level of a vessel without a power supply – visible as a red column. The magnetic system is assembled from a pole disc and various magnets. These can be individually adapted to the different chamber dimensions and for temperatures up to 450 °C. 850/8 Ladkrabang Road, Ladkrabang, Bangkok 10520 Thailand.